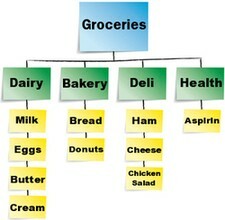 Grab your grocery list and let's go shopping for the perfect internet web site design and website structure. It is important to plan out the primary topic areas of your site and to organize them in such a way that makes navigation intuitive and easy for your visitors. We're headed to the grocery store in this example. The grocery store's (Site Theme) exterior storefront (Look & Feel, Home Page) is what you visually see as you pull up to the store with your shopping list in hand. The grocery store is organized into many different sections such as: Dairy, Produce, Deli, Bakery, Canned Goods, and so on. Those are your Tier 2 pages of topics that directly relate to the overall site theme of "groceries". You make a beeline to pick-up your milk, butter and eggs. Found by quickly navigating to the Dairy Tier 2 page, which lists each individual item available in the dairy isle as a Tier 3 page. You then rush over to the Deli counter (another Tier 2 page) to order your sliced cheese, shaved imported ham and fresh chicken salad (all individual Tier 3 pages under the Deli navigation button). In no time at all you can see that your website could potentially have hundreds of tier 3 pages (the individual items on your grocery list) that each relate to the category of the specific tier 2 topic page. Tier 2 pages make up your navigation menu. You guide your visitors to Tier 3 pages via the links that you place on your Tier 2 pages. When learning everything at once it can feel overwhelming at first. Take a deep breath, take it one step at a time and you will create such a wonderfully designed web site that you will be bursting with pride! Above all, offer great quality content! Bits and Byte's short, quick and easy yet riveting and valuable site building tips will keep your website moving in the fast lane down that high speed road to ebusiness success! site building tips in small, manageable Bits and Bytes.